Newcastle Clinic can accept referrals on the NHS for patients who suffer from claustrophobia. One in ten UK citizens suffer from claustrophobia, according to the NHS, and on average, 37 per cent of patients who undergo a standard MRI scan experience claustrophobic anxiety. MRI scanners are known for creating claustrophobic feelings – even for patients who have never experienced claustrophobia previously. Standard MRI scanners have a small enclosed tube which can evoke anxiety and even panic attacks for many patients, but the open MRI provides a much less stressful experience. 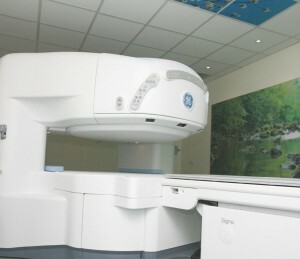 The open MRI scanner is more than double the width of a standard MRI and it has no enclosed tube. This creates a much more comfortable, less claustrophobic experience. It’s also much quieter than a traditional scanner and patients can have cool air blowing on their face to help them remain calm. We can offer claustrophobic patients MRI scans on the NHS or for private self-funded patients. If you require an MRI scan, request a referral to our private clinic from your GP or medical consultant. We will arrange an appointment within one week of instruction and can discuss the scan with you beforehand or even show you the MRI scanner in advance to help ease your mind. You can be accompanied by a family member or friend during your appointment and throughout the scan. This will help distract you and provide additional comfort to ensure you feel at ease while having the MRI. In the open scanner, we can also position patients in different ways to ensure you can make it through the entire scan comfortably. You may be able to lie on your side, at a different angle or can even go in feet-first when possible. The duration of the MRI scan depends on the area(s) of the body being scanned, and on average it takes 45 minutes. The radiographer will be able to tell you an estimated time before the scan and will be available to speak you to at all times. You will also be given a button to press if you experience anxiety or feel you need to take a break. Keep in mind that 99% of our patients successfully complete an MRI in the open scanner. We’ll do everything we can to make the experience positive and as relaxing as possible! Contact us if you have any questions about having an open MRI by filling in the contact form, using LiveChat or ringing us on 0191 281 2636.